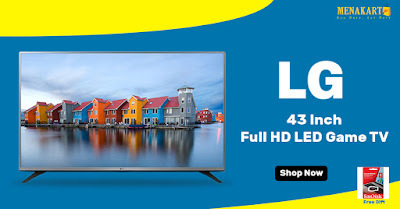 The LG 43LF540 43inch Full HD LED Game TV provides an immersive television viewing and gaming experience that is leagues ahead of its competition. Featuring a 43inch LED backlit panel, this flat screen TV renders content in brilliant Full HD resolution. The flat screen television has three HDMI ports that support uncompressed video data from similarly enabled devices such as games consoles, media players, and more. You can instantly watch movies, enjoy music or view photos that are saved on your storage devices, in Full HD, by plugging them into the TV’s USB port. The flat panel TV sports a sleek metallic design that will add to your modern room décor. This LG smart LED TV incorporates the Motion Eco Sensor Technology that reduces power consumption by adjusting the brightness of the screen according to the speed at which the visuals are being displayed. The LG 43LF540 reviews laud its 43inch LED panel that displays content in Full HD resolutions. It incorporates the Triple XD Engine that helps produce premium quality color, contrast, and brightness for an enthralling entertainment experience. The LG 43LF540 features Active Noise Reduction Technology, which helps in reducing noise from the images, allowing you to view crisp and clear pictures. This flat panel TV comes loaded with three interactive games that you can play with your friends and family. The Monster World game is an engaging action arcade game where you have to collect items while evading or defeating monsters and pumpkins. Bobble Pong is a casual bubble buster game that is widely popular among children. Finally, you can play Valentine, which is a chocolate themed puzzle game.